Twenty-four curious high school students joined the ranks of diligent medical students in the halls of the Medical Building on March 31st. 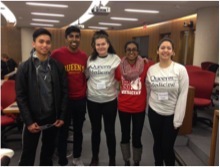 These students were taking part in the first ever “Pathways to Medicine” event hosted by Queen’s School of Medicine’s Diversity Panel. Through a new partnership with a local chapter of a national organization, Pathways to Education, the panel organized a full day event aimed at increasing interest in a future career in medicine among students engaged with Pathways, along with some students from Immigrant Services Kingston and Area (ISKA). Participating students heard from Dr. Michelle Gibson, Director of Year 1, who introduced them to the day. They participated in a small group learning session with Dr. David Bardana and the class of 2020, clinical skills training with tutors Drs. Rick Rowland and Nicola Murdoch, and resuscitation simulation and laparoscopic training sessions with residents, Drs. Kristen Weeksink and Gary Ko, during their visit. Dr. Mala Joneja, Director of Diversity in UGME, sped them on their way with inspiring words. The inaugural “Pathways to Medicine” event was an excellent teaching and outreach event that was highly praised by all staff and students involved. The Diversity Panel is an interdisciplinary team of interested students, educational staff and faculty, which exists to improve undergraduate medical education at Queen’s, through increasing diversity and making careers in medicine more accessible to those from underrepresented populations. There have been many conversations regarding the importance of medical student bodies representing the diversity of the patient communities they will serve in the future. In addition to the upstream effects of making the healthcare profession more adept in providing quality care to the existing diverse population, increased physician diversity is also particularly important when considering the physician shortages that low income neighbourhoods face in Canada. By enticing more students from these neighbourhoods to attend post-secondary education and medical school, there is an increased likelihood they will return to practice in these neighbourhoods, thus helping relieve some health inequities. Though many efforts have been made to make medical school more accessible to students from lower socio-economic backgrounds, many barriers remain. The cost of medical school alone is astronomical, when considering the tuition for an undergraduate degree, MCAT registration fees, application fees, and potential income-earning hours spent studying; students from low income families are already discriminated against. Attempting to address these concerns, the Pathways to Medicine event also included a presentation on financing medical education by Ms. Margie Gordon from the Registrar’s Office, specifically regarding OSAP, grants and other resources available to help these students reach their goals. However, when making efforts to increase the accessibility of medical school for students from diverse socioeconomic backgrounds, the true challenge is in leveling the playing field at the starting line for these students. From the onset of a student’s educational journey, his/her family’s financial and social resources can play a significant role in dictating their success. Strong financial support can assist a student’s ability to excel in school, while also participating in various extracurricular activities, which can benefit the student in future endeavours. Furthermore, students from higher socioeconomic backgrounds are privy to strategic knowledge of what it takes to become competitive applicants as a result of having access to various social resources. These resources can come in the form of connections with academics, physicians and others that have experience navigating the application system. An anecdotal example of how strong social resources can provide an advantage to students is provided by Dylan Hernandez’s opinion column in the NY Times. “Pathways to Medicine” represents Queen’s UGME Diversity Panel’s continued efforts to find creative strategies in addressing this complex challenge. Although this may be a small step towards addressing these barriers, it is our hope that through events like this and other similar initiatives held at medical schools across Canada, students from diverse backgrounds may soon see medicine as a realistic goal. One thought on "Building Bridges, Making Pathways"
Congratulations to the students who have initiated this! Terrific initiative, I am sure all sides learned a lot.